The Chief Executive of Consumer Focus reckons that 6 million UK households are currently experiencing fuel poverty, a figure set to rise to 9 million by 2016. That’s a lot of people thinking twice about putting the heating on, or having to make choices between eating and staying warm. Just like petrol prices a few years back, the inexorable and dramatic increases in the costs of gas and electricity are causing anger and outrage as well as real hardship and, too often, premature deaths. You’d expect the big energy companies to bear this in mind when briefing their ad agencies or approving the work they produce. They must be aware that the EDFs and E.ONs of this world aren’t amongst Britain’s best-loved companies. Especially as they’re French. 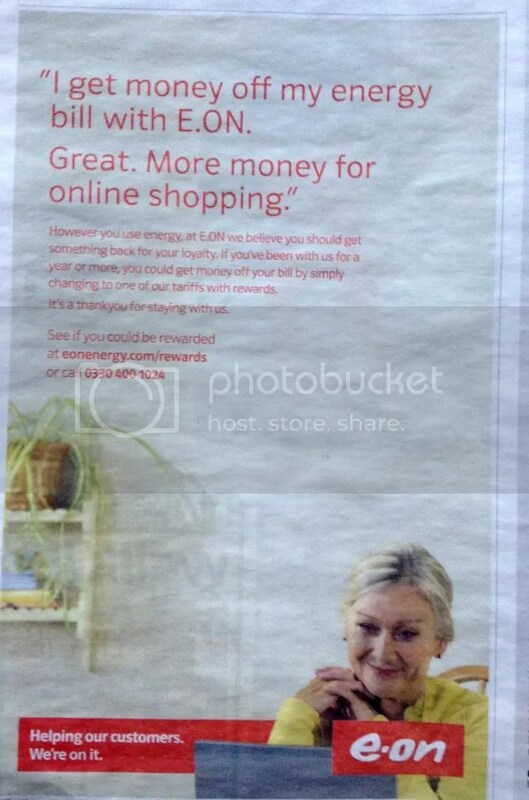 So I can’t understand what makes E.ON think that this advert conveys the right message to its customers. Because that’s obviously the alternative. Not food, or clothes for the kids. Any money you don’t give to e.on can be added to that huge fund earmarked for Net-a-Porter. And what’s with that gratuitous inclusion of ‘online’? That just compounds the felony, as a simple ‘shopping’ would indeed suggest the weekly trip to stock up on life’s necessities. ‘Online shopping’, in contrast, still evokes the buying of treats and luxuries, especially when viewed in context with the image. I think it’s insulting. But then it gets worse with that clunker of a strapline. ‘We’re on it’ doesn’t suggest an ongoing programme at all. The singular version – ‘I’m on it!’ – is what an eager young intern says when asked to perform a challenging new task, usually accompanied by a snap of the fingers. In fact it doesn’t even have the sense of a gradual process as evinced by its much-maligned predecessor, British Rail’s ‘We’re getting there’. Essentially, the news from e.on is good. It is at last doing something positive for its customers, probably as a reaction to the criticism that’s been levelled at it from all sides saying that existing customers are always ignored in favour of lucrative new ones. But I think they could have conveyed the news in a far more sensitive and appropriate way. Meter reading: 0000001. Freelance copywriter with over a million years' experience. No job too small, no fee too large. Service with a simile. No tools left in van overnight. Contents may settle during transit. BraveNewMalden · I'm a copywriter. The dog's just a picture.